1100 North Lake Shore features 76 units located across the street from Oak Street Beach. The duplex floor plans of the A and C tiers of the building are unique for a high rise building. 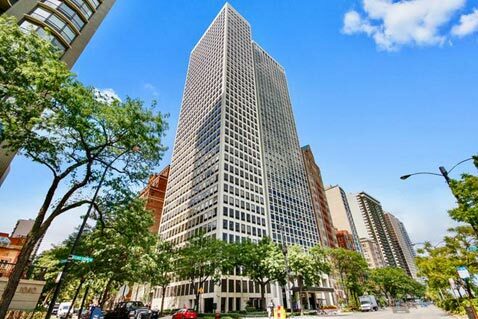 1100 N Lake Shore Drive is a forty story high-rise residential building designed by Chicago architect Harry Weese, situated directly across from Oak Street Beach. Just north of The Magnificent Mile, prospective homebuyers will appreciate its proximity to downtown Chicago and the lakefront. Building amenities include 24-hour door staff, an exercise room, additional storage space, a large Hospitality Room with an attached kitchen and a sun deck. Residences of 1100 North Lake Shore Drive are available in a variety of 2, 3 & 4 bedroom floorplans with modern fixtures and finishes. All units have east and west exposure with unobstructed views of the lake. 1100 N Lake Shore Drive allows both cats and dogs with some weight restrictions. Leased parking and valet service is also available in the attached garage.